Since I'm new to Fedora, I don't know how to install an on-screen keyboard. If u could help that would be wonderful. Fedora (GNOME) has an on-screen keyboard built in to the desktop. It can also be used if you are using Fedora on a touch screen enabled device. If for some reason the on-screen keyboard does not show up when clicking on a text input field, for example when using Firefox, an onscreen keyboard icon should now be visible in the Message tray at the bottom of the screen. To bring up the message tray hover the mouse at the bottom of the screen (Fedora 18) or the bottom right corner (Fedora 17). Click on that icon to force the keyboard to show. 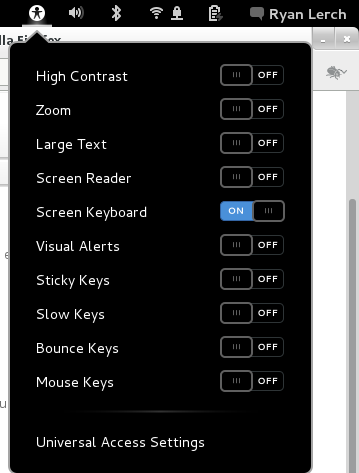 Is there a way to auto enable this for all users, I'm working on a tablet and want this feature on all the time? This should either be a comment to an answer, or a new question.